Today is dear friend Lissa’s Wedding Day! The weather, a warm and sunny April spring day, is almost as beautiful as she! 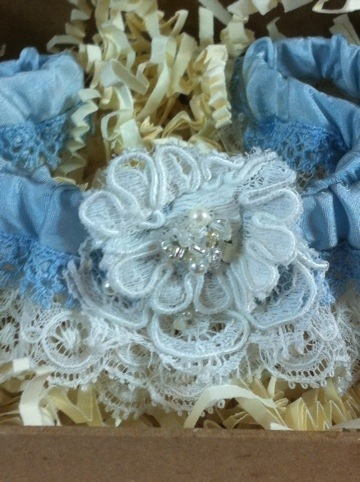 It was Lissa who suggested I start a line of garters, so it is most fitting that I create a very special one for her! Lissa’s I added an extra row of sweet bridal blue vintage cotton lace from my stash. Also is my signature embellishment of a lace fleur, crystals and glass beads. 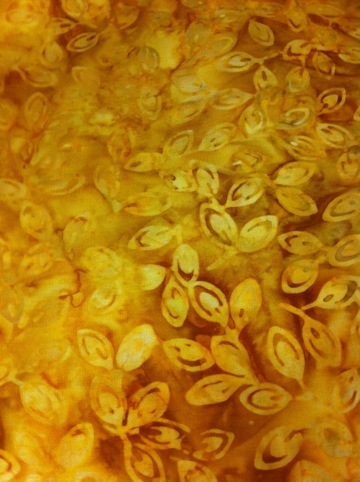 Here’s a little close up of the embellishment…. This little bridal gift needed an appropriate presentation. 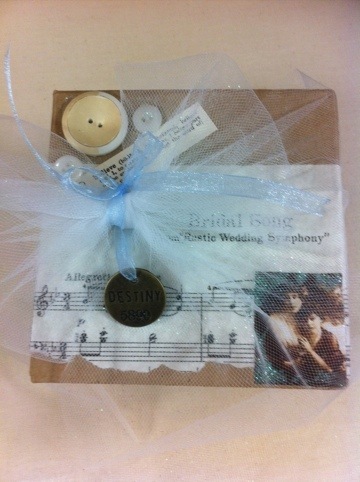 Using a nice sturdy box, from Michael’s, I glued down a piece of vintage wedding sheet music and added some vintage buttons, especially for L who is an exceptional seamstress and designer, a “Destiny”brass charm and then dusted it with some glitter (of course!). 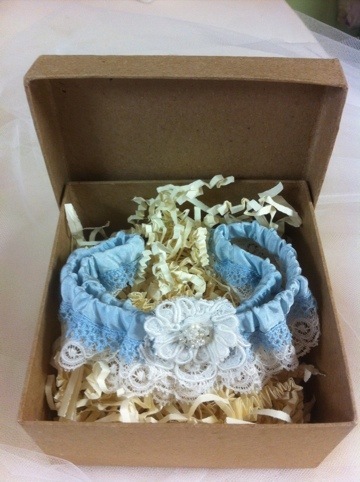 I nested the garter in paper straw and tied the box with tulle. I am so pleased with the result as I hope she will be, congratulations to you Lissa, Glenn is a lucky guy! 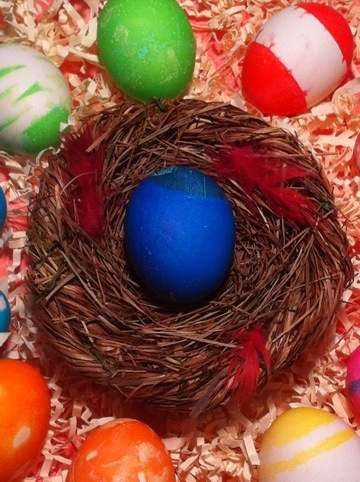 Here is The Easter Egg Class of 2012 dip dyed and presented my daughter and myself. We used the classic Paas coloring set, quilting 1/4″ tape, blue painters tape and foam stick-ons. Nested on deep coral vintage linen, paper straw and a birds nest. 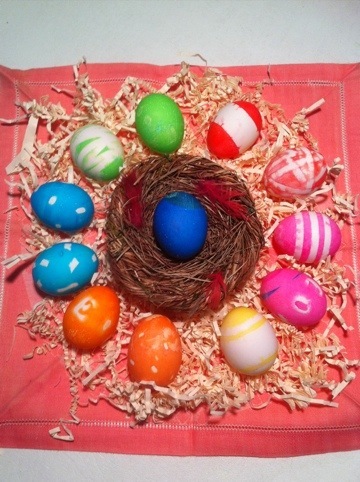 Easter, Passover and Spring blessings and greetings to all my good eggs with Love! It’s coming into that time of the year where we have many wonderful celebrations: graduations, anniversaries etc. And what is more memorable than a keepsake quilt! 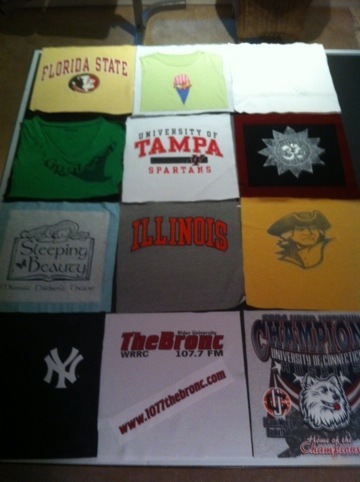 I have made and taught how to make T shirt quilts for several years. This season I have two to make myself: one commemorating my parents 60th wedding anniversary and the second one for our daughter’s upcoming high school graduation. The first step is selecting which T’s make the cut, no pun intended?! For M& D’s quilt I called upon my sibs, their spouses and their children to contribute their favorite T’s. And herein often lies the challenge! I typically use a 15″ block size which is usually a very good fit for most T shirt logos etc, however I did have a few that weren’t T’s at all, rather tank tops or a pretty dressier top and one of the T’s was a child size. So it was time for some Yankee ingenuity: I fused then stitched the usable part of the shirt to a 15″ fused background cloth and voila! Next step was deciding on sashing and border fabrics. I let Mom choose since it will go into their home: she chose navy for sashing and a golden yellow for the wide border. At our local Joann’s I found a great navy Kona cotton and a glorious Indonesian batik with several warm golden yellow tones (pictured)! My next step is to cut up all that and begin piecing. 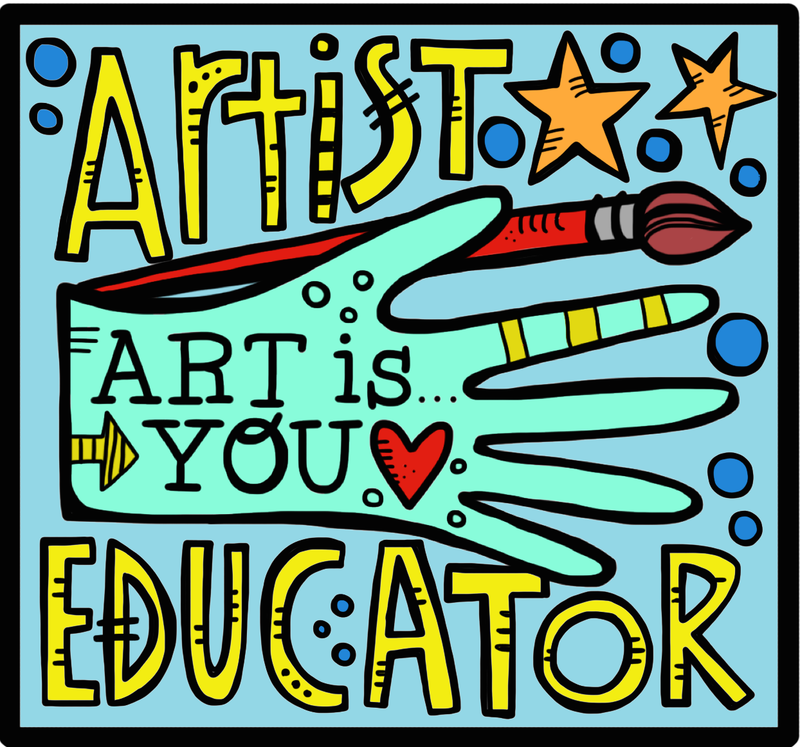 I will keep you all posted on my process! For my daughter’s quilt I will need to sit her down with the bin of T’s that we’ve saved over the years…ahhhhh, another lovely walk down memory lane!